The integration of many nations at Pathways leads to sharing of not just lunch and friendship but also history and culture. The comfort with which these children interact gives an insight into their future where put in any situation, a Pathwayzian will handle it with ease. The school has a colorful mix of students from various nationalities. The students are encouraged to participate in international exchanges and competitions. Our students have also been a part of several educational tours around India. Pathways organizes various trips abroad. This includes visiting places of educational importance like the Singapore botanical gardens and NASA training center. This is the beginning to prepare our students for the challenge of the global world. Such efforts enrich the educational experiences of the students, as well as enhance understanding among the youth of various countries. As we woke up on the morning of the trip, we were all excited about where we were about to go, ‘Agra the city where Taj Mahal resides’. It was 5:30 in the morning on when we walked towards the administration block. The unique autumn morning left us in much surprise with the nippy gust making it more exciting. To our surprise, we saw a huge 50 seater bus awaiting us. We got on, got on to the seats of our own choice and enjoyed a long ride to Agra. Agra welcomed us with the expected heat and a lot of traditional men with monkeys showing amazing tricks and dance with the Cobra dance being another speciality. Ancient Indo-Persian structures were a common sight, each monument we approached felt like the site of the exotic Taj Mahal. Eventually, we went to see our first sight which was ‘Akbar fort’. Being ancient and momentous, this fort had a huge campus with traditional Indo-Islamic influence and a lot of pretty places to take photos. We got an entertaining and a knowledgeable tour from a special guide. It took us a whole day to finish the tour and head back to the hotel. Being the first day, the heat had exhausted us completely. Nevertheless the learning and entertainment were consistent. On getting back to our hotel rooms, we replenished ourselves with the comfort of hot showers and then later we went downstairs to devour an amazingly cooked meal especially for pathwayzians. We went upstairs to enjoy our privacy with the local TV shows and tea ending the evening in our respective beds with the cosy blankets. We woke up early the next day, got ready and went to see one of the wonders of the world, or one could say: the whole purpose for tourists to visit the Mughal capital. Taj Mahal: miraculously flamboyant, besides the Yamuna, still and shining with the constant gleaming rays making it brighter and stunning than any other star. Most of the students went inside it to see more of the history, the rest sat at the main entrance to just gaze at the shimmering iconic beauty. Later, the two group of students after having explored the interior or exterior got together to share their part of adventure. Finally, we all departed to go back to the hotel. The next day, after a short mall trip we returned to school having truly enjoyed the trip uploading our sweet Mughal memories. Boarders in Pathways have a really good time going for hiking and biking during weekends. 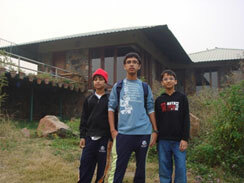 Mr. Gholap one of our old dorm parents take children out of campus in the Aravilis for a great fun on Saturdays. We start at around 6 in the morning, some children walk and some children go on cycles and some people also go on horses. We enjoy the cold breeze and the birds chirping. We always go to a different spot and stop for a while to have tea. We enjoy it. Sometimes we take the cooking utensils and a cook to make Maggi. We all really have a great time there. This hike refreshes us a lot and makes us full of energy. We all wait for Saturdays to come. First I thought that Factory would be very boring. But when I got there the first step I took I know I would like it. I asked Ma’am very politely if I could take two things. So she was very kind to let me do two things. I first took a car. It was a mold made out of white clay. I asked sir if I could get colours to paint. I got the colours and I painted it colourful and beautiful. I showed it to Ma’am. She appreciated it and she gave me a bag to paint. I was happy to colour my bag. I saw some children putting glitter on their bags. So I asked Ma’am to give me some and she gave me a lot. I put the glitter on the fevicol areas where I need them. And my bag looked very pretty. Then I decided to gift my dad the car and Mom the bag. I am sure they will love them. My experience was very delightful and interesting. And it was a total fun ….. I look forward for some more of this kind. On September 5th 2009 forty Pathwaysians braved the harsh Aravali temperament as the hiked around the Aravali Range from as early as 6:30 am. Ten members of the group were teachers who accompanied the students both from the middle and senior school, and helped the youngsters up and around the mountains. The day began at 6:30 sharp, where after a quick breakfast, the Pathwaysians welcomed the warm monsoon morning, and bathed in the orange burnt morn, and allowed the chirping mellifluous lyrics of birds to accompany them on their mini adventure. Then, began the true journey. Living in Pathways can often give the illusion of the entire Aravali range being just as modern and in touch with the latest technology as the school itself. However, as the students and teachers were about to discover, that was far, far from the truth. 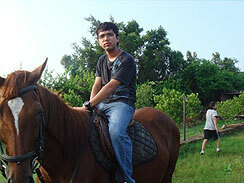 To add variation in their itinerary, horses and bicycles were also present. Working in groups, the students and the teachers alternated between the three different modes of travel – walking, cycling and horse-riding. On average, they must have covered approximately 5 km in a matter of just 3 hours. One of the first surprises came in the form of a small farm, run by a small family. They achieved this feat that for some of us would pose an insurmountable wall, without electricity. They were completely independent. The students and teachers interacted with the family and learned how the family made such wonders possible. There, near their farm, the pathways team decided to halt. After hard and arduous hike around the range, hunger gnawed at their stomachs and demanded food. And so, the students set up a make-shift kitchen where two of the 12th graders – Aashish Charjjer and Raghav Gupta – returned to the school and the Aravali range what they were given and blessed with over the course of 2 long years. Despite being strong, firm vegetarians who have a strong dislike for eggs happily whisked the yellow yolk to make omelettes for their fellow comrades who accompanied them not just through the hike but also through their life at Pathways. Cooking for 40 people by the most professional, gourmet chefs is no easy feat – but for the first chefs, it was even harder. And yet, they undertook the enterprise and cooked food for all that were present. So great was their generosity and love for their fellow Pathwaysians that they even relieved the RKHS staff member of his job for one morning and served them for a change. And then, all too soon the glorious morning came to a regrettable end and the group make their journey back down the Aravali range. Afterwards, only praises of the small adventure blossomed out of their mouths as they reminisced about the morning, somewhat wistfully as they wished for another chance to embark on another refreshing trip like that.